Progressive Foundry Plant Engineer Doug Six. 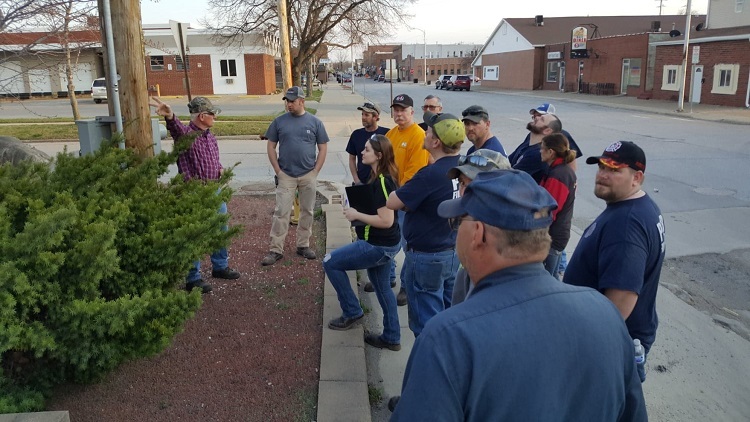 left, and Safety Officer Brittany Schmitz, third from left, led about a dozen PVFD firefighters on a tour of the foundry Tuesday evening. About a dozen PVFD firefighters toured the Progressive Foundry Tuesday evening as part of the department's ongoing preparedness training. 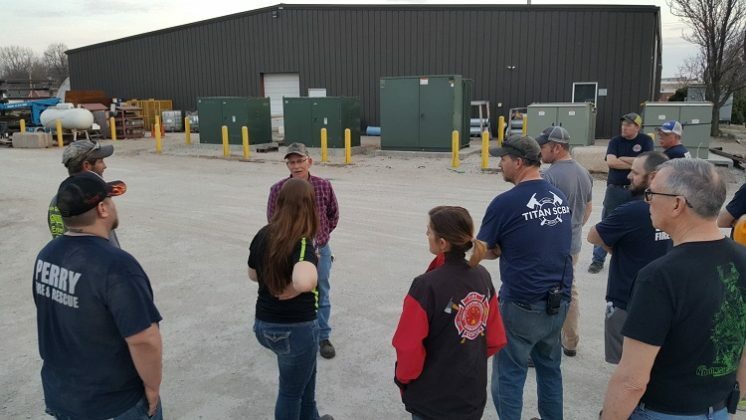 High-voltage electricity was among the potential fire hazards noted when about a dozen PVFD firefighters toured the Progressive Foundry Tuesday evening as part of the department's ongoing preparedness training. 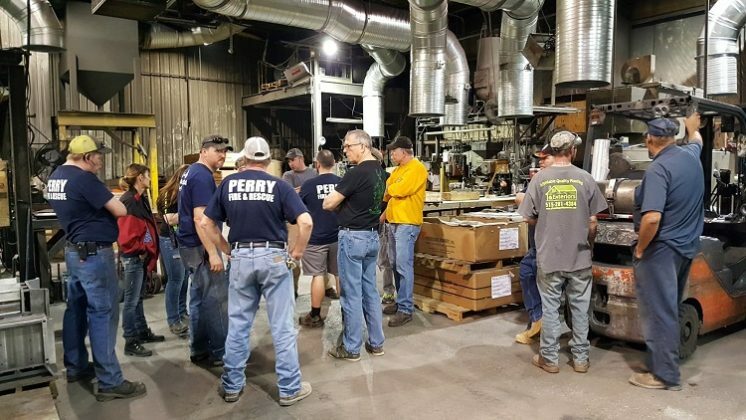 Volatile chemicals were among the potential fire hazards noted when about a dozen PVFD firefighters toured the Progressive Foundry Tuesday evening as part of the department's ongoing preparedness training. A PVFD ladder truck, tanker truck and Perry Firest Responders unit were taken to the Progressive Foundry Tuesday night when firefighters toured the factory. 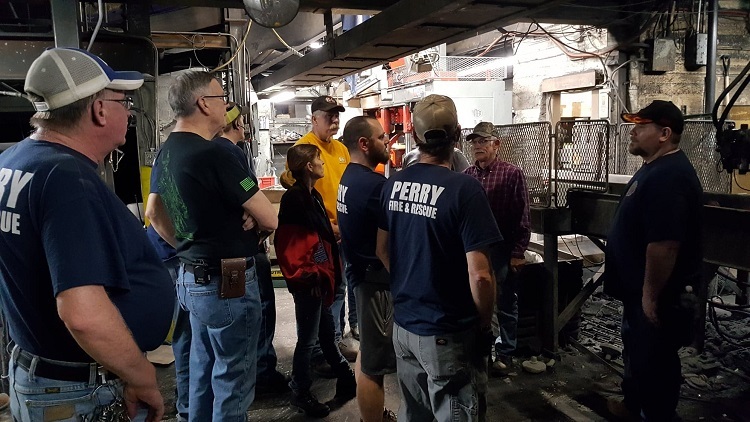 As part of their ongoing preparedness training, members of the Perry Volunteer Fire Department toured the Progressive Foundry (PF) in Perry Tuesday evening in the company of PF Plant Engineer Doug Six and PF Safety Officer Brittany Schmitz. About a dozen Perry firefighters took the hour-long tour, with Six identifying potential flash points around the 66,700-square-foot factory at 1518 First Ave. in Perry. The plant uses a lot of high-voltage electricity and volatile chemicals in the manufacture of gray and ductile cast iron, and these elements pose a fire risk. The molten iron itself, along with its alloys of graphite and manganese sulphide, is ladled out at a temperature of about 4,000 degrees and also poses a fire hazard. 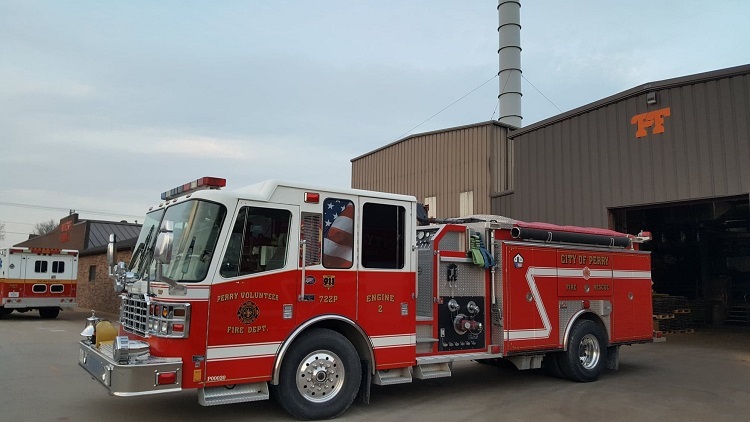 Perry Volunteer Fire Department First Assistant Fire Chief Brian Eiteman said the department tours the foundry and other Perry-area industries yearly to keep abreast of changes in the layouts and processes in the plants.